Welcome to our online store! You can adjust order quantities of each item after you add them to your shopping cart. If you have any questions, please do not hesitate to Contact Us. This beautifully illustrated, 32-page book inspires children to practice good behavior through the positive reinforcement of the Be Good Fairy. Kid-tested and psychologist approved, the stories in the book address behavioral issues such as potty training, going to bed, behaving at school, and sharing. Children can draw the Be Good Fairy, start a journal, and parents can also help their child cut out the door hanger from the hardcover edition of the book to hang on the child’s door for visits from the Be Good Fairy! A companion to The Be Good Fairy, this journal gives children a place to write down what they’ve done to earn rewards from the Be Good Fairy, share their favorite Be Good memories, and spaces to draw what the Fairy leaves them as rewards. Order an additional door hanger for when your child stays at another family member’s house. Or replace a lost door hanger so you don’t miss the next visit by the Be Good Fairy. Get a door hanger personalized with your child’s name printed on the door hanger, so the Be Good Fairy always knows exactly where to leave their reward! This special gift set includes 3 Be Good Fairy items! 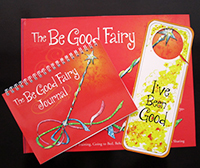 “The Be Good Fairy,” a beautiful hardcover book, “The Be Good Fairy Journal” and an “I’ve Been Good” door hanger. 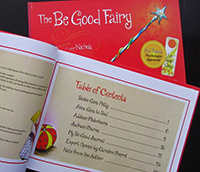 The Be Good Fairy inspires children to practice good behavior through the positive reinforcement. 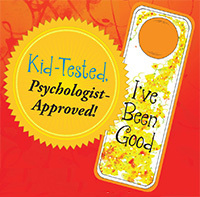 Kid-tested and psychologist approved, the stories in the book address behavioral issues such as potty training, going to bed, behaving at school, and sharing. Children can draw the Be Good Fairy, write and draw in their journal, and hang the door hanger on the child’s door for visits from the Be Good Fairy!